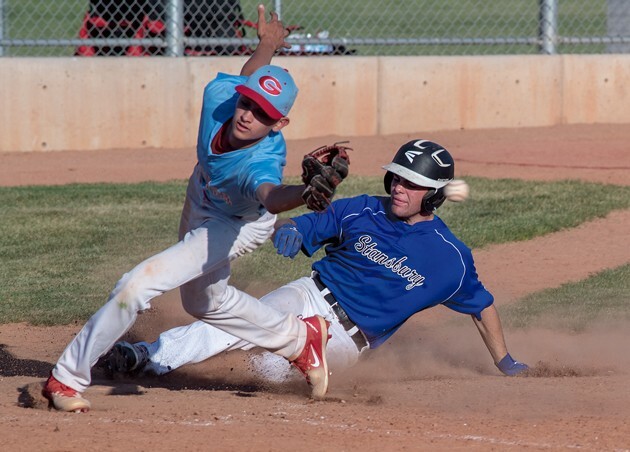 Stansbury’s Connor Fackrell (right) slides safely into home plate to score the Stallions’ second run during the first inning of Wednesday’s summer league game against Granger in West Valley City. Granger won the game 10-9 in four innings. Stansbury catcher Braydon Allie (33) gets some advice from his uncle, Stansbury coach Ray Clinton, during Wednesday’s summer league game against Granger in West Valley City. Allie scored two runs in the game, which the Stallions lost 10-9 in four innings. 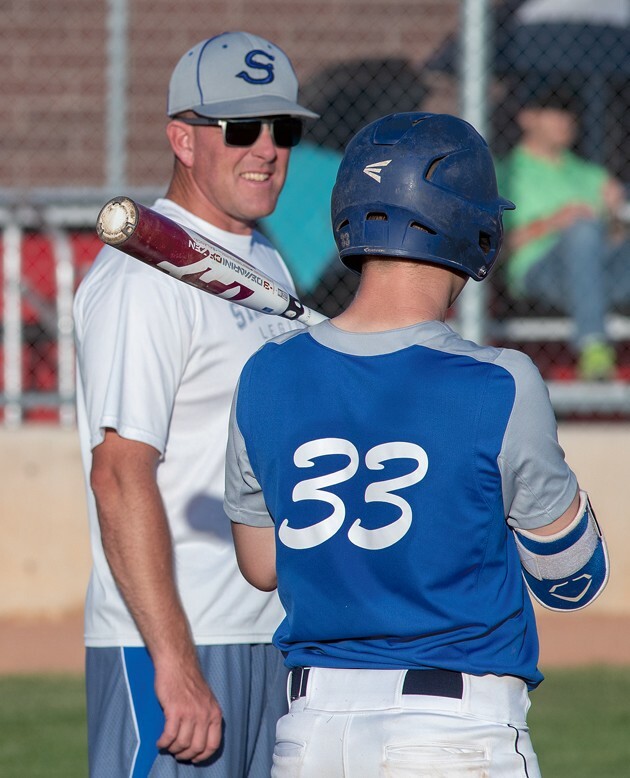 The Stansbury baseball team is a program in transition, having recently learned that longtime head coach Ray Clinton and his assistants won’t be returning next year after a rough 2018 campaign saw them miss the Class 4A state tournament. However, the young Stallions continue to work hard, showing positive signs in a tough 10-9 loss to Granger in summer league play Wednesday in West Valley City. Stansbury led 5-1 after two and a half innings before a mistake-plagued bottom of the third shifted the momentum in the Lancers’ favor. “I think the future of Stansbury High baseball is right where it needs to be,” said Clinton, still coaching the Stallions this summer. 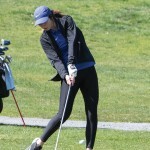 “This younger group coming up is pretty dang good. Stansbury (1-4-1 in summer league) got on the board in the top of the first inning with three runs. 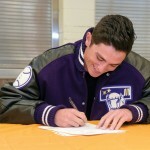 Braydon Allie drew a one-out walk and moved into scoring position when Connor Fackrell reached on a Granger error. After Logan Soderborg’s infield single loaded the bases, Allie scored on a fielder’s choice by Kyle Vorwaller. Fackrell scored on a passed ball and Vorwaller came home on a wild pitch to put the Stallions up 3-0. Granger cut the lead to 3-1 in the bottom of the inning, but Stansbury’s Isaac Hecker led off the top of the second with a walk and scored on Bryant Nicholes’ groundout to restore the Stallions’ three-run advantage. Allie led off the third with a walk and came around to score to make it 5-1, but Granger (1-4) came roaring back in the bottom of the third thanks to a pair of two-out errors that led to four unearned runs. The Lancers led 6-5 after three. With darkness fast approaching, Stansbury scored four times in the top of the fourth. Hecker led off with an infield single and advanced to third on a pair of wild pitches. After Camden Colovich walked, Hecker scored on an errant throw as Granger’s catcher attempted to catch Colovich stealing second. Three consecutive walks by Jace Carroll, Nicholes and Tyler Harris, along with a passed ball that brought Colovich home, kept the inning going, and when the Lancers couldn’t field Allie’s fly ball, Carroll and Nicholes scored to make it 9-6. However, Granger had one last rally left against Fackrell, who came on in relief of Harris on the mound for the bottom of the fourth. A leadoff double was followed by a single that got past the Stallions’ outfielders, cutting the lead to 9-7. The next batter was hit by a pitch, and a base hit loaded the bases before a two-run single up the middle tied the game. Clinton elected to intentionally walk the next batter to load the bases and give the Stallions a force-out at home plate, but the Lancers executed with a walk-off single to left field as the game was called because of darkness. 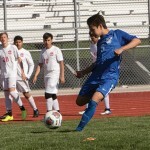 Stansbury’s next summer league game is Monday at home against Kearns.